Biennial conference will be preceded by a two-day short course on Computational Fluid Dynamics. City University London will host the eighth biennial International Conference on Compressors and their Systems. The event will take place on 9th and 10th September and will be preceded by a two day short course (7th and 8th September) on Computational Fluid Dynamics (CFD). The International Conference on Compressors and their Systems has been organised since 1999 in collaboration with City's Centre for Positive Displacement Compressor Technology and the Institution of Mechanical Engineers (IMechE). 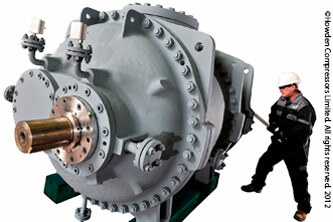 The two-day event will provide a forum in which developments in air, gas and refrigeration compressors can be discussed. It will feature a broad range of participants including industry suppliers, users, research institutions, and equipment manufacturers. Over sixty research papers will be presented on a variety of topics related to compression. They include issues such as Technology Development, Operation, Maintenance and Reliability, Safety and Environmental Impact, Energy Efficiency and Carbon Footprint, System Integration and Behaviour, Upgrades and Refurbishment, Design and Manufacture, Education and Professional Development. Papers of merit will be considered for submission to an IMechE journal. "City's globally recognised Centre for Positive Displacement Compressor Technology has established an enviable reputation over the last 18 years for engineering teaching, research and technology transfer. Next week's conference will be the largest so far, with delegates from 22 countries presenting 67 papers on all aspects of compressor and expander design, development, research and operation. The conference will be preceded by a two-day short course in which eleven internationally acclaimed experts in Computational Fluid Dynamics will advise on the most recent developments in improving positive displacement machines of all types." Please see more information on the conference and the two-day short course on Computational Fluid Dynamics in Positive Displacement Machines for delegates and non-delegates alike.